Automatic Emergency Braking (AEB) and other safety features give you confidence. 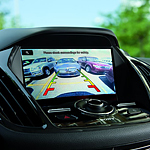 Pre-collision assist with pedestrian detection is the prerequisite to AEB. The feature detects a vehicle or pedestrian who crosses in front of you as you're advancing. Upon detection, a series of warning flashes and alert sounds transpire. If you fail to stop after the warning flashes and alert sounds transpire, AEB deploys to prevent a nasty accident. Blind Spot Information System (BLIS) uses radar to detect vehicles in your blind spot on the road as well as pedestrians crossing behind you as you back out of parking spots. BLIS helps you merge/change lanes more safely and keep from hitting other cars and people when you back out of a parking spot.